SUMMARY: It’s 1752 and in a small town in England a young Agnes Trussel finds herself in a very delicate situation. She is pregnant and unwed and completely unsure of what to do. All she can think of to do is leave and one morning she sneaks out of her childhood home and runs away to London. 18th century London is a dirty, over-populated and scary place to be, especially for a country girl and Agnes is overwhelmed and fearful that she won’t be able to find a job or lodging. A help wanted sign draws her to the home of Mr. Blacklock, a fireworks maker, where she is hired as his assistant. Agnes blossoms in her new role and as time goes by she is shown to have a real talent in the art of firework making. Sensing a kindred spirit Blacklock takes Agnes under his wing and together they set out to make some of the world’s most incredible fireworks. Agnes is thrilled with her new venture, but there’s one thing that threatens to ruin it all – her advancing pregnancy. MY THOUGHTS: I really thought I would like this book much better than I did and now that I’m reading through reviews on Amazon, it seems my 3 star rating is in the minority. Borodale’s writing wasn’t bad, but the story itself just didn’t make sense at times and the characters were pretty one dimensional – the lack of depth made it hard to feel any sympathy for any of them. The pregnancy aspect got on my nerves too – between several attempts at aborting the baby (which never worked) and trying to snare a guy just to try and pass it off as his (and this while she was in her last trimester). I mean, how the heck did she think that would work? Also, no one in the household noticed that she was with child, but whenever she would run into someone on the street, the first thing their eyes focused on was her belly. Ugh – it drove me crazy!! One of the reasons why this book appealed to me in the first place was that it was marketed as reminiscent of The Year of Wonders, which is a book that I adore, but I have no idea where they came up with that from. It’s nothing like it, not one bit. 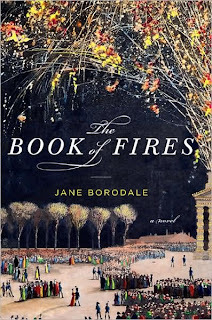 I realize they are both about a woman prevailing over diversity, but that’s the extent of it – one novel is about a town wiped out by the plague and the other about an un-wed, pregnant girl in London, making fireworks. I would’ve given this book 2.5 stars, but the ending brought it up a bit to 3 stars. This is the author’s first novel and while I didn’t care for it, I would most definitely read her again, as I sense a real budding talent on the HF scene! FCC: This book was given to me for review by Viking Press. I HATE one-dimensional characters! I considered requesting this book for review, but I think I need to try a little harder to get out of my Georgian England comfort zone (especially since so many books set there recently disappoint me). Will give this one a miss, I think! Telling it as it is...no way around it for this one, it seems. One-dimensional characters and botched abortion attempts- no way similar to the outstanding The Year of Wonders. Thanks, Amy for a realistic review. Hmmm, I had read several glowing reviews. Sometimes it is good to get balance. I don't know how I feel about this one - it sounds promising but I might wait to try this one. Although, you and I tend to see eye to eye on books. Very good, honest review Amy. Good honest review!! It is hard to read a book that doesnt grab you an not let go... that is usually when I stop. I am trying harder to finish a book as I have in the past.!! I think I have mentioned it before, but Year of Wonders is one of my favorite books. Therefore, if you found it NOTHING like that one, I would have to say I would agree with you on your review. Why would they compare it to that book. Too bad. I may pass on this one. Thanks for an honest review! Thank you...I've been waiting to hear some reviews of this book that reflected what I felt. I didn't like it at all......apart from the pregnancy all that pyrotechnics stuff in the middle got so boring. I did like some of her descriptive writing, particularly of the countryside, and agree.....first book, next time might be better. Sorry this didn't cut it for you. No worries, some things just rub you the wrong way and other people wouldn't notice it. Loved your honesty Amy, sorry it was disappointing but as you mention, maybe next time, "budding talent" and all! I totally agree with your review,as I was soo looking forward to reading this one after reading the blurb in the bookstore. It just didn't hum for me, and in the end I was rushing to read it and get into the next book on the pile. Amy, I sooooooo agree with you a out the story not making sense. I got this book a few weeks ago and still haven't finished it. I keep putting it down. I was interested in it because the advance praise equated it to Sarah Waters. NOT! I think her imagery is good, but I can't get through this book. I will be doing a review eventually...if I ever finish it. I am very disappointed as well. I had high hopes.